Newport Aquarium’s Paula the penguin got a sneak peak of the new Penguins of Madagascar film at AMC Theatres at Newport on the Levee. NEWPORT, Ky. – Newport Aquarium announced Wednesday a partnership with AMC Theatres at Newport on the Levee that allows the public to enjoy penguins both in real life and on the big screen for one low cost. Starting Wednesday, a combo ticket* that includes admission to Newport Aquarium and an AMC Gold ticket voucher to see Penguins of Madagascar will be available for purchase at the Newport on the Levee Welcome Center. An adult combo ticket runs $28, kids ages 2-12 can receive the deal for $20, while children under 2 years can get this exclusive deal at no cost. Newport Aquarium Annual Passholders can purchase AMC Gold ticket vouchers for $8 at the information desk located in the front lobby of the Aquarium. 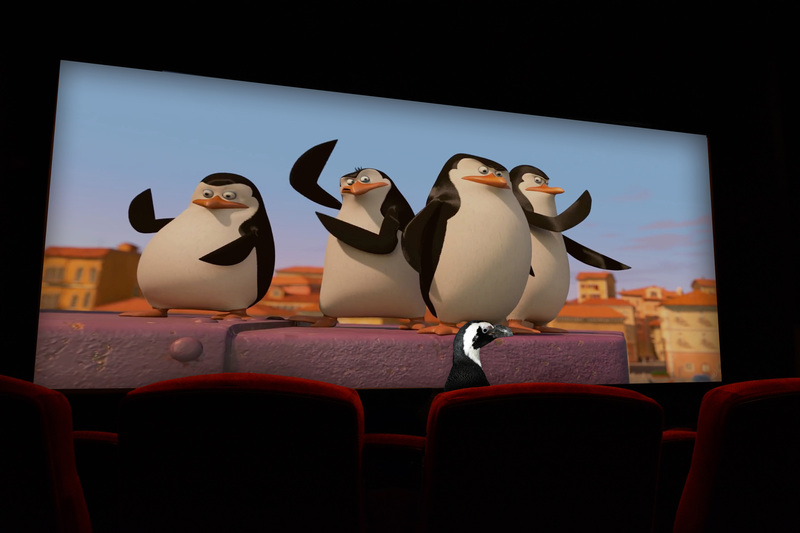 Moviegoers who plan to see the 2:15 p.m. showing of Penguins of Madagascar on Nov. 26 at AMC Theatres at Newport on the Levee will get to see Newport Aquarium’s African penguins walk the red carpet and be treated to an exclusive penguin encounter to celebrate the film’s opening. 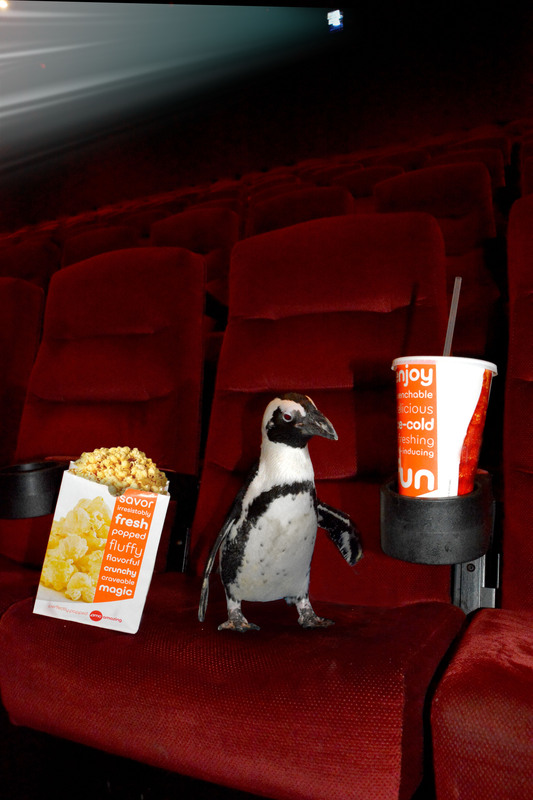 Newport Aquarium’s Paula the African penguin made herself comfortable while getting a preview of the new Penguins of Madagascar movie at AMC Theatres at Newport on the Levee. Admission to Newport Aquarium gives guests the chance to visit Kroger Penguin Palooza. With five species of penguin – king, chinstrap, gentoo, macaroni and rockhopper – totaling 49 birds, the Kroger Penguin Palooza exhibit features one of the most diverse collections of penguins in the country. A sixth penguin species, the African penguin, is also on exhibit at Newport Aquarium in The Penguin House. Guests can get up close and personal with these friendly birds with the addition of a Penguin Encounter to their admission ticket. Penguin Encounters are available for purchase at both the Newport on the Levee Welcome Center and the Newport Aquarium ticket window. Penguins of Madagascar, the highly anticipated latest chapter of the popular Madagascar film series from DreamWorks, is set to open in theaters nationwide Wednesday, Nov. 26. To contact the Newport on the Levee Welcome Center, call 859-291-0550 ext. 2. New Year’s Eve: 11 a.m. to 6 p.m.
New Year’s Day: Noon to 6 p.m. 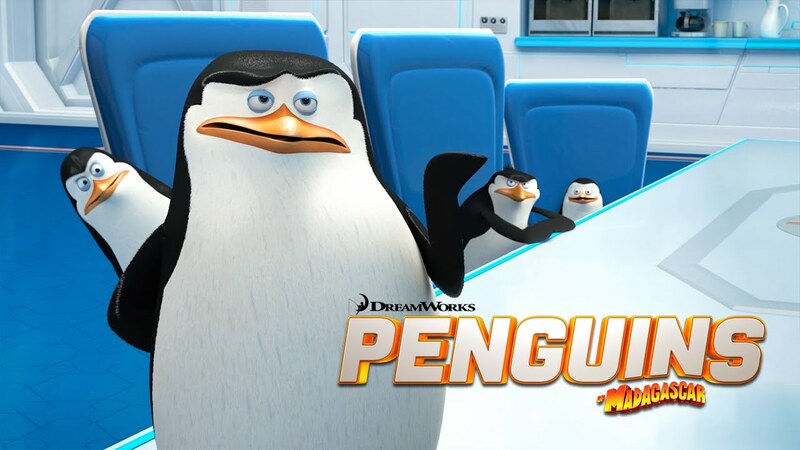 This entry was posted in Penguins and tagged AMC Theatres, DreamWorks, movie, newport aquarium, penguin, Penguins of Madagascar by NewportAquarium. Bookmark the permalink.